What are the Benefits and Advantages of Rainwater Harvesting? 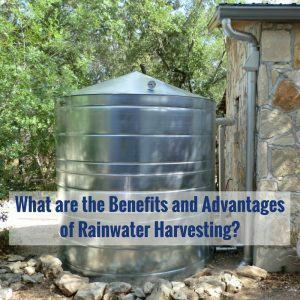 Rainwater harvesting has many benefits but the main one is that it is a sustainable water management practice that can be implemented by anyone on many different levels, from a simple rain barrel to a comprehensive rainwater harvesting system that integrates with an irrigation system or household plumbing. When you think about it… do we need to use municipally treated water to sprinkle on our lawns and landscaping? Definitely not! Harvested rainwater is the perfect candidate for irrigation use in addition to so many other water uses. By using rainwater harvesting systems to supply water for some, or all of our water needs, you can reduce our dependence on municipally treated water. Overall, rainwater harvesting is viewed as a practice that is socially acceptable and environmentally responsible all the while, promoting self-sufficiency. The rainwater that falls on your roof and property is essentially free. All it takes is a method to harvest it into a tank or cistern for later use. Rainwater harvesting can be a great educational tool to get people to recognize their individual or household water usage. This can get them to start conserving water in other areas around their home. For communities that rely on imported water to supply their needs, collecting rainwater that falls naturally in the community can reduce the need for imported water. Rainwater harvesting helps utilities reduce peak demands during summer months, saving treated water for more important and appropriate water uses. While rainwater can be a perfect primary water source for many uses and situations, it is also a great backup water supply for emergency situations. Rainwater harvesting can reduce stormwater runoff from a property. The elimination of runoff can reduce contamination of surface water with pesticides, sediment, metals, and fertilizers. By reducing stormwater runoff, rainwater harvesting can reduce a storm’s peak flow volume and velocity in local creeks, streams, and rivers, thereby reducing the potential for streambank erosion. Rainwater harvesting systems can be employed as simple and effective methods to meet a municipality’s stormwater management program requirements of individual properties. It is an excellent source of water for plants and landscape irrigation since it has no chemicals such as fluoride and chloramines (chlorine). While the logical use of rainwater harvesting is for water conservation purposes, it also reduces energy use within a community. Typically, the end use of the rainwater is located on the property where the rainwater is collected. Replacing municipal water use at a home and property with rainwater reduces the amount of water that a municipality has to treat and then pump to your house. The treatment and pumping of municipally provided water require a lot of energy. The implementation of rainwater harvesting can help meet new standards of energy and water efficiency ratings and codes that are being developed in communities. Reducing municipal water use for areas such as irrigation reduces the amount of water that a municipality has to treat and pump. This, in turn, reduces water service cost to a municipality. The widespread implementation of rainwater harvesting within a municipality’s service area can reduce the long-term water development needs of a city, allowing the city to use their existing water infrastructure investments more efficiently. The cost to the community to supply treated water is becoming more expensive every year. The cost to construct dams, pipes, and treatment plants, not to mention the cost of maintenance and infrastructure replacement is huge. As water users, the rate-payers in the community ultimately will foot this rising bill. Therefore, the practice of rainwater harvesting can reduce water demand and thus allow municipalities to provide potable water service at a lower cost. Designing and installing rainwater collection systems can provide sustainable jobs for the economy of the future. The rainwater harvesting industry can become a leading employer in the green infrastructure movement. Rainwater stored onsite in a rainwater harvesting system can be available for wildfires and help protect the house and property. Insurance companies can offer discounts for storing water onsite for fire protection. Rainwater can be used for irrigation use, indoor non-potable water use, and/or potable water supply. Rainwater harvesting can provide an independent water source in areas where other water sources are unavailable, or the water quality is unacceptable, or they are too expensive to develop, or they are too difficult to obtain. If used as a potable water source, the zero hardness of rainwater provides many advantages. It eliminates the scale build-up in household appliances that could occur with the use of other water sources. This will extend the life of the appliances. In addition, it reduces the amount of detergent or soaps needed in laundry and dishwashing appliances, reducing money spent on these detergents and soaps. Rainwater from a potable rainwater harvesting system that has been properly filtered and disinfected is some of the best tasting water available. It doesn’t have the many chemicals that municipally treated water has such as fluoride or chloramines (chlorine). 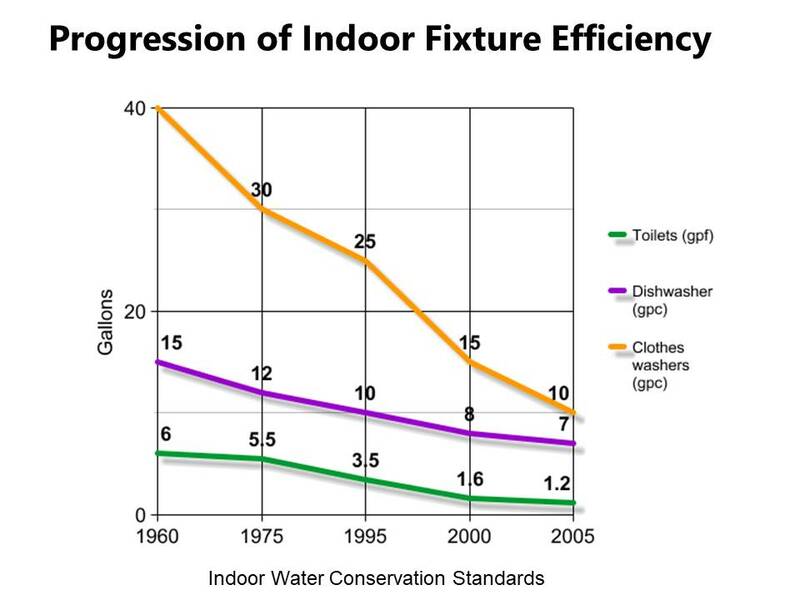 Ever since the US government enacted national standards in the U.S. Energy Policy Act of 1992 and set minimum efficiency standards for all toilets, showers, urinals and faucets manufactured in the United States, the opportunities for indoor water conservation has decreased. During this time, outdoor water use efficiency standards have somewhat been neglected. Therefore, rainwater harvesting provides a tremendous opportunity to achieve more water conservation gains at each and every residential and commercial property. You see this statement everywhere, even in the list of benefits above: “Rainwater harvesting will help conserve water and reduce municipal water use.” While it will do these things, just installing a rain barrel or rainwater cistern under a downspout, won’t accomplish much. There is a key component that is missing… having a strategy or method to use all of the collected rainwater in an efficient manner. If the harvested rainwater is not used efficiently, then the rain barrel or tank will essentially stay full. Then the new rainwater from each rain storm will just overflow the storage volume and provide no water conservation benefit. Therefore, a truly effective rainwater harvesting system employs a method to use the harvested rainwater in a timely manner. This could be accomplished through both passive and active methods. A passive method could use a distribution system that automatically distributes rainwater by gravity through a distribution pipe or tubing system. An active method would be through a pump system that can pressurize the rainwater into an automated irrigation system. Without thinking about how you will use the harvested rainwater, the practice of rainwater harvesting loses its impact. As you can see from the benefits and advantages listed above, the practice of rainwater harvesting is an important and vital part of developing a sustainable water resource path for any community. As local water resources are stretched to provide for population growth and economic development, new water supply strategies and paradigms will be necessary to meet this demand. Rainwater harvesting is an untapped resource that could be developed quickly within communities and that will also have a tremendous impact. Rainwater harvesting is part of a sustainable water supply strategy for local communities. I am a professional civil engineer and urban planner that focuses on creating impacting and sustainable projects by identifying all of the hidden water conservation opportunities available in a project. I am particularly interested in working within the realms of sustainable site planning, integrated water management and planning, and low impact development practices. We are Social. Connect with IWS. I consent to Innovative Water Solutions LLC collecting my details through this form.